AM Detox: Antioxidant rich green tea is paired with cleansing dandelion, burdock, and orange for a crisp, nourishing tonic. Beautea Sleep: Chamomile and passion flower are combined with notes of lavender, cherry, and lemon for a calming elixer. Spa Day: Soothing herbs of lemongrass, licorice and peppermint marry with mellow linden flower to guide you on the path to relaxation. Fountain of Youth: Hibiscus, white tea and green tea, paired with anti-inflammatory turmeric and rose hip. A fruity fusion! Chill Out: Passion flower marries with tulsi and lavender. Slender Sips: Oolong tea and yerba mate unite with delicious notes of creamy coconut, zesty lemon, and soothing ginger. 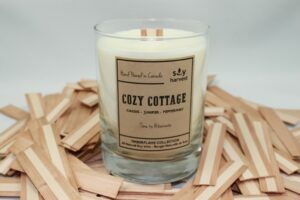 Cozy Cottage: Birch leaves, lemon and tonka beans make up this warm and cozy scent. Back Country: Autumn air with a hint of musk, woods and a little bit of spice. Autumn Snuggle: A blend of cassis, peppermint and Juniper. Coconut Sunset: A mix of sweet, creamy coconut, fresh lemongrass, and lily. Happiness & Bounty: Refreshing blend of peppermint , spearmint, bergamot. Sugar Plum: Ripe berries, peaches and sweet musk create the perfect holiday scent. Dream robe ($59): Softer than silk and cozier than the warmest hug, this robe is pure magic. Sweatshirt robe ($95): Lightweight and super comfortable this contemporary robe is made from the fabric of your favourite sweatshirt! Microfibre lined ($99): Chic, warm and oh so soft! This best-selling robe is lined with exclusive shimmer plush fabric, and is a warm option for those cold winter nights. These are great additions to any evening bath, providing aromatherapy to to promote relaxation. Our favourites? Just Say Spaaah: Relaxing blend of peppermint and eucalyptus. Beauty Bomb: Calming lavender, tea tree and activated charcoal. Keep Calm: A perfect blend of rosemary and sweet orange. Chill Pill: Refreshing Lemon, lime shower steamer. Head to toe indulgence, anyone!? A spa gift card is a reason for someone to disconnect, relax and be pampered. A very popular way to spoil that person you love! Gift cards are available when purchased in-person at the spa, or printable gift certificates are available online or by phone. Spa 901 is open 7 days a week for gift certificate and retail purchases and we invite you to stop in to browse our full retail selection.